If you're an avid flute video watcher, please scroll down and subscribe to this blog (free, no obligation of any kind.) You'll then be notified when there are new posts and videos added. Part Two of my video-answer is now available below. Recently on this flute teaching blog I've been answering questions about teaching a 12 yr. old novice band student in the first 10 to 20 lessons. Part One of my answer dealt with headjoint only and RH-on-the-barrel. This second segment develops ideas for the novice teacher in balancing the flute, and includes trills, finger position and flute balancing tips. Headjoint-only tunes with groovin' rhythms on play-along CD. Also has playalong demonstration pieces using only the notes G, A, B, C which is great for RH-on-the-barrel playing. Easy rhythmic reading, rhythm explanations, samples; advancing slowly. Find it here at Mel Bay. Jen says: Highly recommended to have as a resource book for selected exercises tailored to student. CD-backing tracks only contain easiest exercises for first half of the book. You may wish to follow up with other flute piece books with CD-accompaniment if having a playalong CD seems to help the student's interest level and musical ear. $10. If you want to use a beginner book that doesn't come with CD but is equally good, use Trevor Wye's Beginner Book of the Flute Volume One. Used copies at Powells Books. If this CD is unavailable, and an inexpensive substitute is sought, try the flute & harp recording by Naxos entitled "Dance of the Blessed Spirits" by Nora Shulman $6-$8. Lots of standard flute repertoire for the student to listen to as well as use in class for finding pulse, listening to rhythms, playing simplified versions for novice students using limited pitches. Especially for those flute teachers who play piano to accompany students in lessons of hundreds of Flute Solos with Piano all in one book. Karen Smithson's "PLAYING THE FLUTE" piano accompaniment volume. All score form with small flute parts; progressive; good quality classical and folk tunes. All tunes winners/pedagogically helpful. Full sized flute parts are contained in each of her method books volumes 1 to 5, but if student is only going to buy one $25 book full of easy and progressive flute solos, this one is highly highly recommended: Playing the Flute Piano Accomp. Smithson books also available at any regular music store for ordering by name, and at Fluteworld and JustFlutes. Jessica Walsh's "CELTIC MUSIC FOR FLUTE" book with CD. Read about creating duets and link to the cover of this book here. This is the book I use all the time with novice students. Many of the solos can be made into duets, and you get about 40 pieces in the celtic style all with varying rhythms and different challenges. Topics: Breathing, Chair position in band, standing to practice, tonguing. Best of luck, and ask more questions if unclear. As a new flute student, I have benefited greatly from your articles and videos. I do have a question about the embouchure. Mary Byrne's article mentions that the student should not be concerned with the placement of the hole, but with the smile part of the lip plate. I have read from others that the hole of the lip plate should be placed between where the wet and dry place of the lip meets. Also, that the bottom lip should cover at least 1/3 of the hole. I have been trying to practice this especially doing tone practice for low notes. What is your take on this lip positioning? Should we concern ourselves at any point with the hole or just the plate against the chin skin? Thanks. Mary Byrne's "First lesson" handout is about teaching the VERY FIRST lesson. What she is saying, I think, is that it is less confusing for the student if you don't start talking about where the embouchure hole should go. The answer to your question about covering 1/3rd of the blow hole, and exactly where the edge of the blow-hole should go is somewhat covered in my tone articles. It's an individual matter depending on the thickness of the student's lips (every person has different lip and chin structures) and how long they've been playing, and what kind of control they have over the tone. Work with a good teacher, and you will gradually discover what works for you. Hope this helps answer your very good question. Thanks, and I look forward to more of your videos. "I have read from others that the hole of the lip plate should be placed between where the wet and dry place of the lip meets." The edge of the blow hole usually goes at the red-line-of-the-lower-lip, which is where the red part of the lip becomes the flesh-tone skin of the chin. This is for thin-lipped players, or medium-thin-lipped players. Thick lipped players might have the edge of the blow hole half way up their lower lip!!! So, it very much depends on where each flutist gets their best, most flexible tone quality. 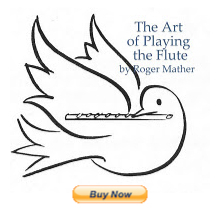 then get a private teacher and/or read Roger Mather's "The Art of Playing the Flute" by ordering it at your library (Interlibrary loan). Mather covers this topic with extensive written experiments for the flutist who's played 2-3 years or more.